List of X’s blog is “An Ostensibly Funny Commentary* of the Recent News and Events. But believe me, List of X’s commentary is funny, very funny, ostensibly or not. We shouldn’t have any gun regulation laws because bad guys will always find a way to break the law. You’re not proposing to repeal all laws against theft and murder just because bad guys will always find to break them, are you? But let’s talk about something that’s really close to your heart. Why do we bother having a 2nd Amendment on the books, anyway? Those bad guys in the government (and they’re the worst, don’t you agree?) will find a way to trample it and confiscate your gun anyway. Knives, hammers, and cars also kill people, so let’s ban them too! Sorry, those murders by hammers just don’t add up, even if we include hammerhead sharks and MC Hammer. But if we are talking about people killed by dull objects in general, then yes, those dull objects with guns in their hands do kill a lot of people. Plus, there is tiny difference between a gun and a car that might be escaping your attention. A gun has a sole purpose of killing people or other living things, while a car or a knife have a variety of other useful purposes. If you still don’t see the difference, then you probably aren’t using your car or knife correctly. It’s too soon to talk about gun control. We always hear this one after every shooting, and for some reason, it’s always too soon. I have no idea how you would determine when it is exactly the right time to talk about it. Is there a specific number of people that’s supposed to be killed before we can talk about it? And interestingly, while it’s always too soon to talk about gun control, it’s not too soon to sell more guns. At least, I am not aware of gun shops closing even for an hour after Sandy Hook shooting. Armed society is a polite society. If that really were true, then Yemen and Somalia must be two of the most polite countries on Earth. We’re not aware of it only because these countries never brag how polite they are out of their sheer politeness. But let’s suppose everyone is armed here in the US. Why are you so sure that everyone will be going out of THEIR way to be nice to YOU, and not the other way around? Guns don’t kill people, people kill people. If the only real purpose that guns have is to kill people, and guns don’t kill people, then what’s the point of having them? You might as well be using cars and knives for that. Or does that mean you are only buying guns because those evil Yankees made it illegal to buy people? Armed citizen can stop a massacre: Sure, an armed citizen can stop a massacre, and that this probably even happened at a few shootings. But you’ll never guess what happens at every shooting: yep, an armed citizen starts a massacre! Every patriot needs an assault rifle to fight tyranny. Of course, by tyranny you mean that democratically elected government that you didn’t vote for, and by enemies you are planning to fight you mean your fellow Americans. You know, I haven’t had a civics class in a while, but I don’t remember anything about measuring the level of someone’s patriotism by the number of fellow Americans they plan to kill. Though it would make more sense if you were taking your civics lessons from the Taliban. They can have my gun when they pry it from my cold, dead hands. I have to warn you, if the government really decides to come after you with all its tanks, helicopters, drone, bombs, and laser-guided missiles, it really won’t be that difficult for them to pry your guns from you cold, dead hands. The hardest part will be to actually find those cold, dead hands of yours among all the smoldering rubble. 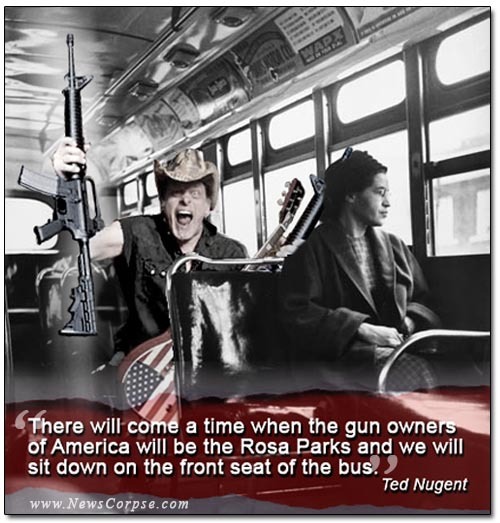 Gun owners will be the next Rosa Parks and will sit in the front of the bus! I guess that’s supposed to mean that gun owners are tired of being required to walk in “gun owner only” parks, drink at “gun owner only” fountains, banned from entering gun-free zones, and sick of living in constant fear of being lynched by hippies. I guess that noise made by all those politicians loudly professing their love for the 2nd amendment, plus the sound of non-stop shooting, masks the unimaginable suffering of the gun owners. Though I have to wonder, how do you envision your nonviolent resistance? Or do you just believe that “violence” can only be something directed at you, while your 100-bullet per minute resistance should be called “defending freedom”? Can’t breathe. Laughing. Good stuff, X. Man, I love your lists. I’m going to try to memorize this one for the next time I see my inlaws. I should add that my grandfather was murdered – in his store, by his own gun. He lived by guns and died by them. Kylie here: Wow. That is terrible. So, so terrible. I’m so sorry. My father was killed by a gun, too, during a military accident (did you read my post, When You Were My Age?) and I’ve been working on gun violence prevention the last six months. It’s so important yet such a hard, exhausting cause. I hope List of X sees your comment. I just read (and watched) your right to bear harms. So emotional, and yet people don’t get it. Most of my father’s family do not get it. I’m not sure how he came out of that mess to be the peace loving man that he is. I was going to write a response, but it got so long, I might just turn it into a post. okay, it’s up. I’ll probably lose readers and get nasty comments. I don’t care. Thank you for your post. It gave me the push to put this up there, for whatever good it will do. Wow, that was fast! Right on! Looks like you’ve been getting very supportive comments. The mainstream is there… they are just usually quiet. You gave them an opportunity to speak up. What a great post. Truly. Thank you. I figured I’d lose readers, but not so far. It needed to be said. I wonder what will happen when Charlton Heston dies? Who will be the next celebrity face of the NRA? Sarah Palin? Can’t think of anyone else! I simply love this piece. I guess it’s because I, like the rest of the world (except maybe people in Yemen and Somalia), am wondering why the US has such a large number of gun afficionados. I mean these are all ridiculous arguments and you are doing an amazing job refuting them all, but my “favourite” one would have to be #10. What idiots! I guess you got yourself a new follower here. Thank you! And thank you for following my blog. You should also consider following Kylie, because, unlike me, she’s actually doing something to help take guns off the streets. There are, of course, valid arguments for guns, but the ones above are those we hear more often. It still baffles me that people are okay with needing to get a license to drive, and fish, you even need to get a license to get married…but any wing nut can own a bazooka and no one needs to know about it! Until of course that wing nut decides to take out a classroom full of kids. According to NRA, no one needs to know about the bazooka even then, because taking out a classroom full of kids is our constitutional right. Let’s just both thank those gun nuts. Always good for comic relief and a random shooting spree. True, though I rather have them focus on the former. If it were up to us, that would be nice. Spot on list X. As a survivor of gun violence I have had a dog in this fight for many years. When I hear some of the idiotic rhetoric from the gun lovers side of the house I can only stare open mouthed, it is difficult to reply at times. One has to wonder, do you think if one or two of these idiots were actual victims of random violence, losing life as they know it or a loved one, would they view the world differently? I’d think some of those people may change their minds, but in a lot of cases they would just think that being better armed would have prevented them from becoming a victim. I remember watching a Congress testimony of a woman whose parents were were shot in front of her, and she wished she had a gun with her that day. She didn’t wish for any firmer gun control. And I can’t blame her for that, really. She probably would have been able to shoot that guy and save her parents. But the problem is, the law wouldn’t be relaxed just for her. It would have to be relaxed for everyone. But if everyone would be allowed to carry a gun legally, where would easily be 5,000-10,000 more deaths every year nationwide, if you take into account the higher murder rate from the states with lax gun laws and extrapolate it onto the states with stricter laws. That last one really hits home. I love this, especially the point about it never being “too soon” to sell more guns. BTW, do you ever listen to This American Life? They had a great segment recently about the tendency for people who are completely unlike Rosa Parks to compare themselves to her. 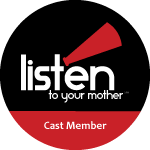 I listen to NPR rather often, although never once happened upon this program. I am not surprised that many people compare themselves to Rosa Parks, because that comes from the same place as assuming Jesus Christ or Martin Luther King would somehow posthumously approve their actions, and you don’t have to listen to TAL to know how common that is. The list of reasons is much longer than ten. But I had to stop somewhere, and 10 was just a natural place for me to stop 🙂 I even accept that there are valid reasons, like hunting, sport shooting, or desire to protect one’s house from wild animals or criminals, if you happen to live in an unsafe area. But I don’t think there is a ever a reasonable explanation for why someone needs an assault rifle or opposes a background check. Thank you Ms. Kylie, this is magnificent. Great post. For any of you readers who were previously unaware of the fountain of wisdom and wit which is known as “List of X”, do the right thing and follow him, blindly if necessary. You’ll be glad you did. Wow #8 is right on the money. well said. 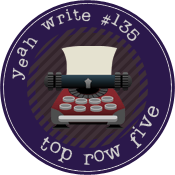 I’ve never re-blogged anything to List of X, not even my own guest posts I write for other blogs, because I am trying to keep this blog true to the form I had accidentally chosen a couple of years ago. But this post I wrote for “The Life Of Kylie” blog is something I could have posted here. Though, if it weren’t for Kylie’s idea for the post, I would’ve never written it. And please check out the rest of her blog, too. Just recently a dog knocked his owner’s gun off the front seat of his car and it went off and shot the guy in the leg. So now you can say, guns don’t kill people, dogs kill people? Probably. I’m expecting NRA to call for instituting a universal background check for dogs sometime soon. Great list. What happened to common sense? It just doesn’t sell guns that well. Well said. It was nice to include Crazy Ted. I almost forgot about him (guess my mind was trying to block anything Nugent-related), but Kylie kindly reminded me about this verbal gem of his. Great post, Kylie. I agree with all your points. They seem so smart and common sense to me. Wish they did to everyone. 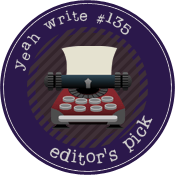 I wouldn’t want to appear as if I’m stealing your compliment, but I’ll definitely have to thank Kylie for suggesting this great idea for my guest post. Excellent list! I have nothing to add. I’m just shocked that no real changes have been made. I especially like #8 and #9. There were some changes – New York and Colorado passed gun control laws, and at least there is a gun control discussion on a federal level. It’s not nearly enough, but it’s better that complete silence that was before. You’re right. I guess I had just hoped for some swooping change, but I think it will be slow and will have to celebrate the small victories, one by one. Now is a good time to call your senators! I heard at least 5 of these at the FoCo town-hall meeting on Sat. While I agree that it’s mostly BS, it’s not the way to get a good discussion going that gets anywhere. I’m actually thinking about writing a letter to the editor to the local papers about this. You are correct, my post wasn’t really an attempt to start a serious discussion, though I wouldn’t mind if it did. But how can you seriously argue with nonsense (#10) or a metaphor (#9, #5, #6)? (at least, I hope these are metaphors)? I believe the word is “delusion”…but that doesn’t mean that it’s not the truth for these guys. They’re so paranoid that they plunge themselves in any suiting world view that seems to keep their guns “safely” in their hands. So how to have a serious discussion with delusional people…it’s probably best not to have it with them, but with the majority of the gun owners who have some sense. I’m not American, so this is an overall and continuous culture shock with me. But I guess you understand them as little as I do. A good thing is that even a majority or NRA members are sane, as most of them support the universal background check. Yet the only ones we hear are the crazy ones, and those out to make some money off selling more guns. Neither of these groups would welcome a real discussion. I’m not 100% American either, but I’m sure a lot of Americans do not understand these people either. People who are extremists on either side politically generally rub me the wrong way. While I don’t agree with a total bans on guns, since I don’t see how it’s possible at this point, I appreciate your post. I do laugh at the idea that the government and it’s military branches would be stopped from trouncing our rights (whatever that means) by Joe Bob and Lil Tim and their assault rifle weilding army of yokels. Yes, I have no idea what those people are thinking. Maybe they’ve watched Red Dawn too many times. The British and their military branches were stopped from trouncing the rights of the colonists, and by the way, it was by, mostly, Joe Bob and Lil Tim. Remember the circumstances that started the War of Independence. The British were on their way to confiscate powder, ball and cannon. Joe Bob and Lil Tim did very well against the British with their one-shot muskets, and I thank them for their bravery and for our independence. But then the British didn’t have tanks, drones, planes, helicopters, missiles and other fun stuff than the U.S. military has today. If they did, the Revolutionary war would have been over after Lexington and Concord. Well said. I was actually preparing to write something similar! Thank you! 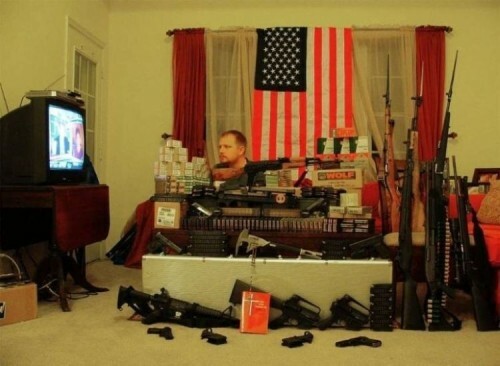 I’m not surprised you wanted to write something like that, and you can still do that: I had a hard time limiting myself just to 10 items: there’s so much gun-related craziness out there that you could compile a few more lists.